I actually enjoy using these emoticons because it gave me more flexibility in giving feedback to my friends's post. It was a bit constricting before when there was only the "Like" button. I mean how do you react to news about the passing of a friend's relative? "Like" doesn't do the job well, does it? 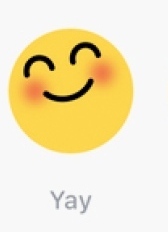 When they first released the Reactions last year, Facebook included a "Yay" button which was a smiling and blushing yellow orb. 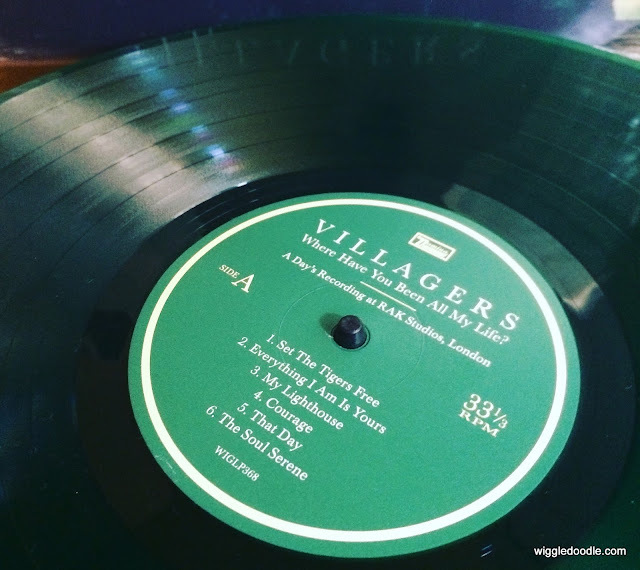 Too bad they dropped it after a few months. Maybe it didn't have enough users to make the Facebook guys to keep it. Anyway, "Wow" is good enough for me. But I hope I wouldn't get to use that "Angry" button too often. To add a reaction, hold down the Like button on mobile or hover over the Like button on desktop to see the reaction image options, then tap either Like, Love, Haha, Wow, Sad or Angry. For those looking for the "Dislike" button however, I don't think it will come anytime soon. Labbits with babies, that's what! I love Labbits! Those lovable rabbit character created by San Francisco pop artist, Frank Kozik for Kidrobot. 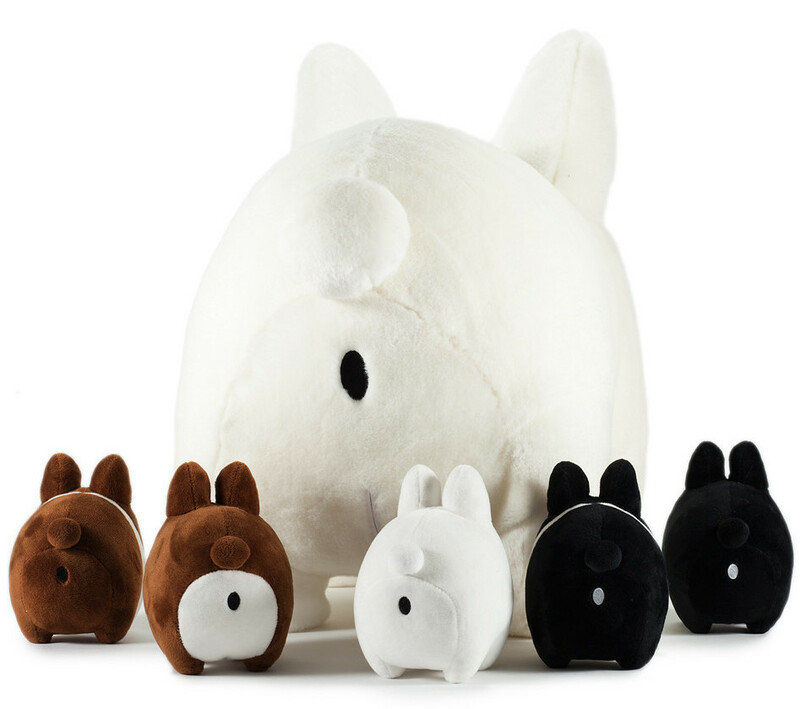 They come in different forms and the most famous is the original smorkin' Labbit variety but there are also the happy Labbits while some can also be found sporting a handsome 'stache. 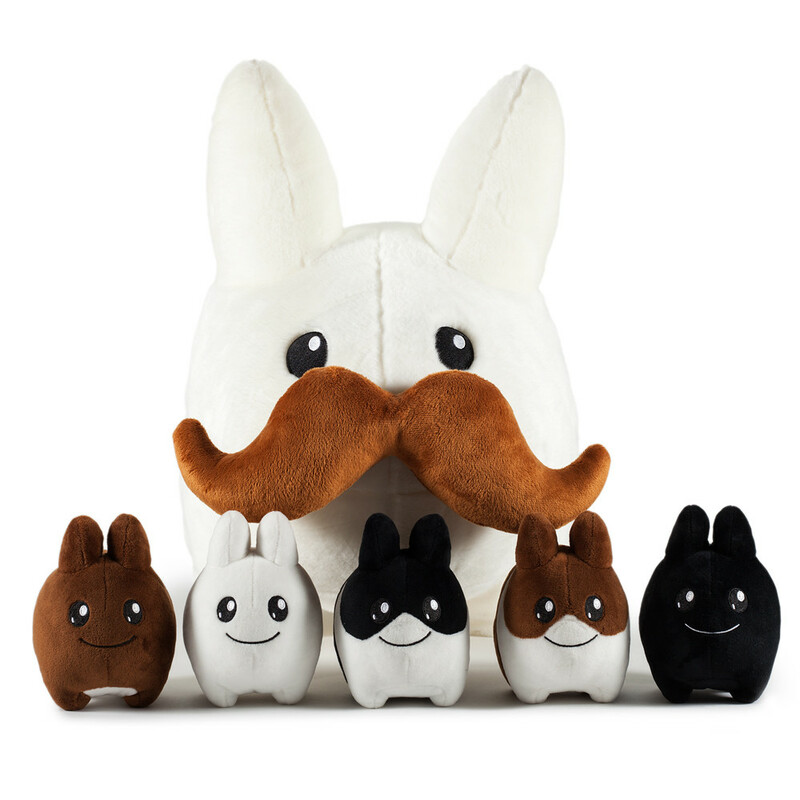 Now Kidrobot introduces a 24" plush Stache Labbit which is the first of it's kind, coming with five adorable baby Labbits, also known as Littons. Zipped in the 24" Labbit's stomach you will find the removable 4" Littons inside. Isn't that cute. I just hope this one gets here in the Philippines through Secret Fresh maybe. I think the smile on those little Littons face is enough for me to get one for my collection. What do you think? 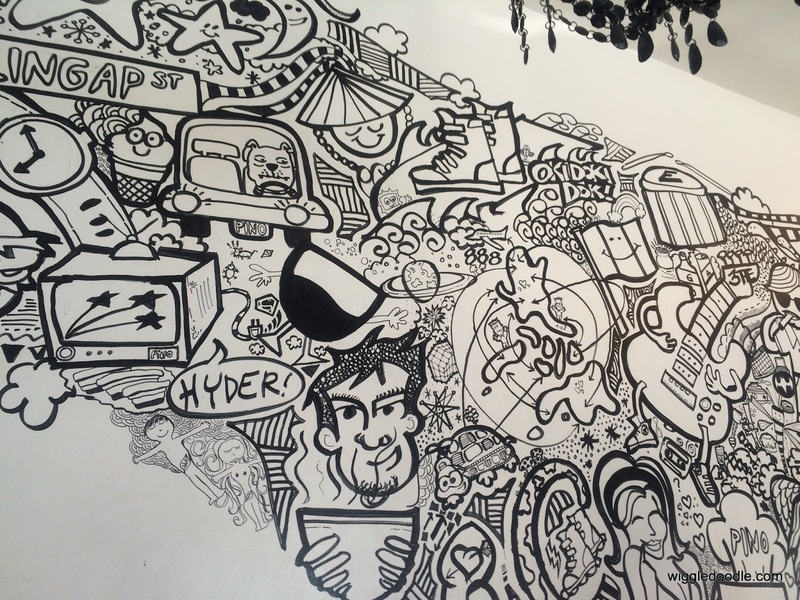 We recently had lunch at Pino Street at Maginhawa St., the famed food haven of Quezon City. We chose Pino from other eateries in the area because I read about their best seller, the Kare Kare Bagnet. I love kare kare. It's a special dish for our family. For the uninitiated, it is a traditional Filipino stew in thick peanut sauce. It contains vegetables like eggplant, string beans, among others. We usually use ox tripe but some people prefer ox tail, beef, pork leg, even mixed seafoods. To give it an extra kick, we use bagoong alamang. Bagnet is an Ilocano delicacy made from pork loin that is deep fried until the skin and outside layer of meat become crispy while the inside remains juicy. The picture at left is the first thing that you will see upon entering Pino. 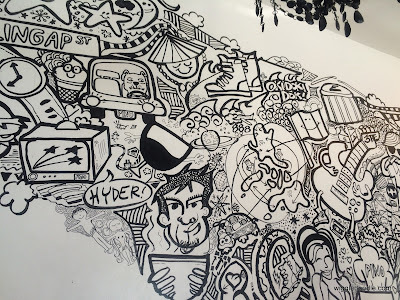 It is actually a line drawing that filled an entire wall. We decided to sit under it. 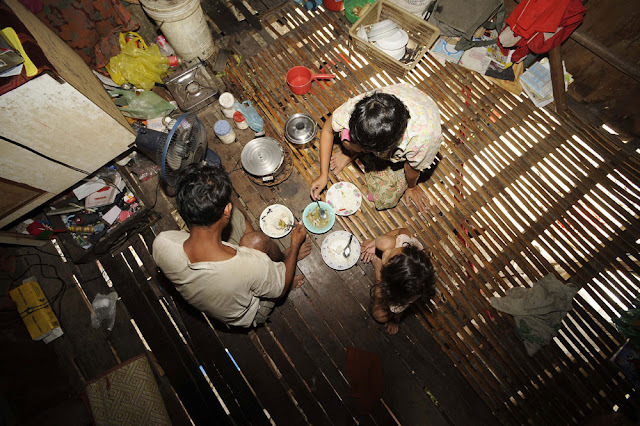 The place is rather small with just around 10 tables for three to four persons. It wasn't full when we got there but I immediately noticed that there were only three persons serving the tables and it looked like the orders were taking some time. 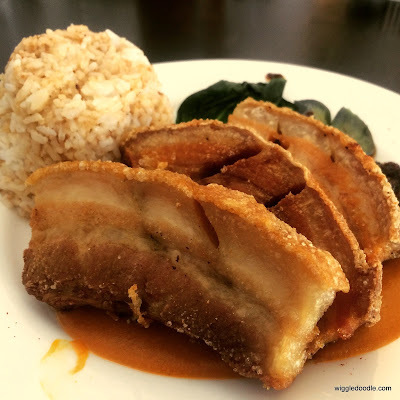 From the picture in the menu, the Kare Kare Bagnet looked like trouble for someone watching his diet. Two of us, including me, chose the Kare Kare Bagnet while the other two decided to try the seafood kare kare. Maybe they got scared of what they saw in the picture, It took almost thirty minutes before our orders arrived. The Kare Kare Bagnet did not disappoint. It consisted of three slices of bagnet with vegetables on the side and the sauce in the bottom. The set meal also comes with a cup of steamed rice and a glass of ice tea. It tasted good, even the bagoong that came with it complemented the taste of the food. But it is so fat! I could only finish one slice of the bagnet and I already felt heady. If you have problems with your blood pressure like I do, I advise that you be careful with this one. In a word it is sinful - gloriously sinful. At its price point, the meal is a good buy. But don't over indulge or you might get more than you wished for.